14ymedio, Miami, 6 September 2018 – More than 100 Cubans have been expelled from Panama so far this year, according to figures revealed by the National Immigration Service to 14ymedio. Cubans occupy fifth place in the number of nationals expelled, deported or voluntarily returned, surpassed only by Venezuela, Colombia, Nicaragua and the Dominican Republic. According to the National Migration Service’s explanation to this newspaper “the deportation of Cuban citizens maintained an upward form in the months of May (13), June (17), July (18) and August (27), while the largest amount of expulsions of the islanders thus far in 2018, occurred during the month of May. The authorities added that the main causes for expulsions are irregular stay and residency in the country and the expiration of visas. “The foreigner who has been deported may not enter the country for a period of 5 to 10 years,” warns the National Immigration Service. 298 Cubans with irregular status in Panama have been arrested thus far this year. 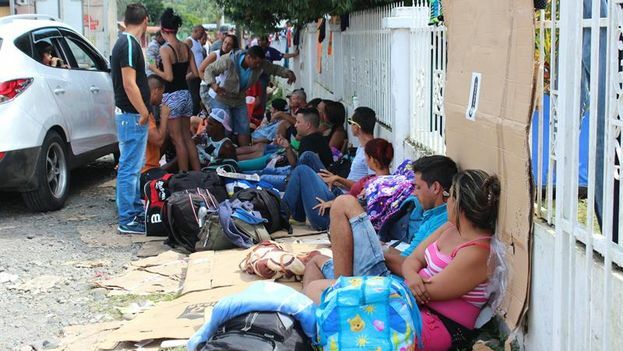 According to official statistics, Cubans occupy second place in the number of arrests only behind Colombia, a border country, and Venezuela, which is experiencing an unprecedented exodus. Panama, along with Costa Rica, are countries of transit for thousands of Cubans who come to the United States border every year seeking refuge. In 2016, both countries were the epicenter of a crisis when thousands of Cubans were stranded in their territories. After an agreement with Mexico and economic aid from the United States, more than 9,000 Cubans were transported on two airlifts to the southern border of the United States. In January 2017, a few days before the end of his term, President Barack Obama put an end to the wet foot /dry foot policy, which provisionally welcomed Cubans arriving in the United States. Although the number of Cuban migrants to the United States dropped drastically, thousands continue arriving at the border to ask for political asylum. Some Latin American countries have experienced a rapid increase in Cuban emigration. Panama is also one of the main destinations for “mules”, Cubans who travel legally to buy products and resell them in the island’s large black market. So far this year more than 25,600 entries have been recorded coming from Cuba.